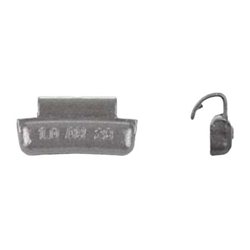 AWN Type Lead Clip-on Wheel Weight Coated 1 1/2oz BOWES WW AWN150 Box of 25. Wheel Protectors® - Coated Wheel Weights for Alloy Wheels. The AWN-Series lead clip-on wheel weight is used on most domestic vehicles equipped with alloy rims that were manufactured prior to 1995. Also available in an uncoated finish (AW-Series).